People often ask me, "Why don't you review something I can actually afford?" This popped into my head as I was sitting handling the brand-new Nighthawk Falcon Commander, as nice (and expensive) a custom pistol as you're likely to find. I subscribe to car magazines, and one complaint I have (and one I'm sure they hear a lot) is their focus on uber-expensive cars almost no one reading the magazine can afford: Ferraris, Porsches, Lamborghinis, etc. I know why they do it, but I still wish they would focus on what they call "everyday drivers"â€”Malibus, Fusions, Avengers, etc. I suddenly realized I'm that guy, the same freakin' guy, writing the articles I myself complain aboutâ€”only the subject matter is different. Why do we do it? Why do we look forward to reviewing high-end guns? I love striker-fired guns, but look at them. You can hardly tell them apart without reading the model number on the slide, and they all look the same: boring. Those custom, expensive pistols? They're pretty, they're awesome, they are literally handmade works of art. You may only be able to afford one in your lifetime, but that doesn't mean you can't dream about and lust after them every month. And I'm here to help. Nighthawk Custom is the new kid on the block when it comes to custom 1911s, but it seems to be the company making all the right moves. The firm has paired with legendary gunsmiths (Bob Marvel, Richard Heinie) and trainers (Chris Costa) to produce some truly unique and well thought-out designs. The original, Government-length Falcon debuted in 2011, and it set a sales record for Nighthawk. Why? It was pretty much everything you might want or need in a 1911, and then some. However, for some people, a five-inch Government-model length gun is just a little bit too long. Considering a lot of people consider the Colt Commander-size 1911 to be the ultimate 1911 when it comes to concealed carry, is it any wonder Nighthawk came out with the Falcon Commander? Sporting a 4.25-inch barrel, the Nighthawk Commander has a full-length grip, keeping the same 8+1 capacity in .45 ACP. What sets both the original and Commander-size Falcon apart from the crowd is what most of us in the business call the "Hi Power" cut on the slide. The front of the Falcon's slide is narrowed and in appearance resembles the front of a Browning Hi Power slide. The beveled edge angles back and downward and meets the front of the frame's dust cover. How much is the slide narrowed? According to my calipers, the thick part of the Falcon Commander's slide is 0.915 inch wide. The narrowed front section is 0.87â€”not a huge difference, but it's there. The difference is enough to see and feel, and in handling the pistol I was able to use the step cut like a single vertical slide serration to rack the slide from the front. Let there be no mistake. Custom 1911s earn that designation because they are assembled and fit by hand. While they are assembled from CNC-machined parts, expert gunsmiths put them together, and the Nighthawk pistols don't go out the door until the craftsmen are satisfied. An accurate pistol is one that consistently locks up the same way every time, and the all-steel design of the 1911 allows gunsmiths to fit the slide, frame and barrel as tight or loose as they want. Too tight and the pistol won't cycle; too loose and accuracy starts to suffer. The fit on the Falcon Commander was perfect. There was no wiggle at all, and yet the slide cycled easily by hand. The barrel bushing is stainless steel and chamfered around the edges, and the barrel is crowned at what looks to be a 45-degree angle. The front of the recoil spring plug is completely flat, and the end result is a muzzle end of a pistol that is very attractive. Another feature aside from the Hi Power slide cut that sets the Falcon Commander apart is the ball radius cuts. The slide serrations are ball radius cuts (ball radius means round bottomed; imagine the cuts were made with a BB), and there are three such cuts running down the top of the slide. The top of the slide has been traditionally serrated to reduce glare on the sights. I don't know how much glare smooth-bottomed ball radius cuts would mitigate, but they sure look cool. There are also three minimal vertical ball radius cuts on the raised bottom of the grip safety. Sights are Heinies, set into dovetails. The rear is the Heinie Ledge, which has a tritium insert below the notch, and the front of the rear sight has been angled vertically to allow the slide to be cycled with one hand. The rear of the slide has been serrated at 40 lpi to match the serrations on the Heinie Ledge rear sight. The front sight is a post with a white-outline tritium insert. This sighting system is a variation on the Heinie Straight Eight, which places one dot above the other for quick sight acquisition. The rear non-outlined tritium insert comes into play only in low light, but you'll be mighty glad it's there if you need it. The hammer is a rounded Commander style, and it nestles into a perfectly fitted beavertail grip safety. The grip safety was fit on an Ed Brown pattern cut to the frame, which is the highest in the business.Between the high grip safety and how high the front of the frame was cut underneath the trigger guard, the shooter is really able to choke up on the gun. How much of a difference in grip height is there between the grip safety and undercut frontstrap of the Falcon and a standard GI-type pistol? At least a quarter of an inch. If that doesn't sound like much, trust me, it is. That's why people have been paying big bucks to gunsmiths for years. Moving your hand higher on any kind of a pistol increases controllability and reduces felt recoil. The front of the frame has been checkered 30 lpi. The flat mainspring housing has been checkered 30 lpi as well and is of one piece with the magazine well. Nighthawk's integrated mainspring housing/magwell is an excellent design, cut from a solid 2.5-inch block of solid tool steel. While it does add a little length to the pistol, it doesn't add any sharp corners, and corners are what print against clothes more than anything else. What it does do is make it much easier and quicker to reload the pistol. Speaking of corners, every sharp edge on the pistol has been gently rounded off, except for the grip checkering and front sight/rear notch. This means neither your clothes nor your holster will get sliced up. The Falcon Commander sent to me had an ambidextrous safety, which is a $120 upgrade over the base model. The clicks up and down were positive and audible, which is exactly how I like it. Grips provided on the Falcon Commander are black, made of G10 composite and have what I've started calling a "tactical golf ball" pattern. They are more aggressive than they look, and between the grips and the checkering the pistol will not move in your hand, no matter the adverse weather conditions. How do I know? The first time I brought the pistol out to shoot was on camera while filming a segment for the Guns & Ammo TV show. Temperatures were in the low 40s, and it started to rain. Even though I could barely feel my fingers, the gun didn't move in my hand, and I never missed a shot even with the cameras rolling. Of course, it helps to have a really accurate gun, and excellent ammo; I was testing out the brand new Nosler Match Grade Handgun 185-grain jacketed hollowpoints (see the accompanying chart). The trigger pull on the Falcon Commander had a short take-up followed by a crisp 3.5-pound break. Back in the day when I carried 1911s, this was exactly the same weight trigger pull I had on my carry guns. 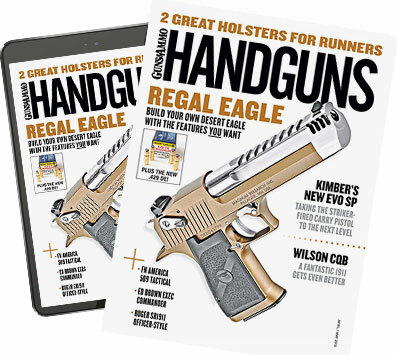 If you've learned to keep your finger off the trigger, that is a completely acceptable trigger pull weight on a carry gunâ€”especially for a 1911, which has both a grip and manual thumb safety that have to be deactivated before firing. While the black Falcon Commander looks like it has a very nice matte blue finish, it actually has a nitride/Melonite finish. This is a durable finish when it comes to everyday use, but use of certain cleaning solvents may cause some damage. Nighthawk recommends avoiding any cleaning products that contain trichloroethylene, ammoniated solvents or strong alkaline solvents. To make things easier, the company includes a small bottle of Gibbs Lubricant and Cleaner. I let them sit out in their open nylon cases to dry for about an hour, then closed them up and put them in the back of my vehicle. There they sat until I got home late the next day. I immediately opened up the cases to check on the pistols and found they both already had minor rust on their sights (26 hours after getting rained on). This tells me that while the Nighthawk guns are nitride/Melonited, the sights aren't. I've rusted enough carry guns with sweat over the years to learn that a corrosion-resistant finish is a good idea even on your sights. This is really a minor complaint with the Nighthawk guns (the rust wiped right off) and has no effect on function, but I'd be remiss if I didn't pass on my experience. The lack of a rust-resistant finish on the sights is the only flaw in this otherwise perfect execution of the Commander-sized 1911 design. The pistol ships with two eight-round magazines (one blue and one stainless), polymer bushing wrench, owner's manual, and one test target showing a three-shot one hole group at 15 yards with semi-wadcutter ammo. Honestly, people who can shoot groups that size just irritate me because they make me look bad. Expensive? Yes, the Nighthawk Falcon Commander costs as much as my first three cars combined, but you get what you pay for. In the case of the Falcon Commander, you get a hand made, custom pistol pretty enough to put in a display case and yet reliable and powerful enough to wear on your hip.